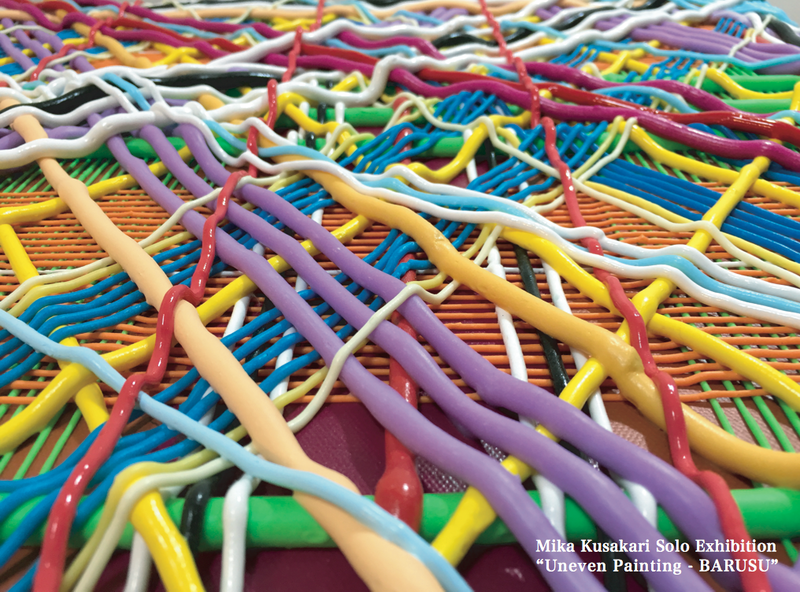 We proudly present Mika Kusakari’s solo exhibition “Uneven Painting – BARUSU,” which follows her “Uneven Painting” held at TAV Gallery last year, as her new development of the series seeking the gap between one, two and three dimensions inside the frame of painting. Main large new exhibits are “Autograph” work in 2000×3000 mm which consists of 24 pieces (500×500mm, each) and “Homage” work in 2000×2000 mm which consists of 16 pieces (500×500mm, each). Kusakari, who styles herself megalomaniac existentialist, believes a direct connection between the inside of the work and the world as the outside at a certain important aspect. That is, the work for Kusakari overlaps with “Barusu,” the spell to end the world in the famous Japanimation “Laputa.” All-time possibility to be taken apart derived from the set canvas system especially in large-sized works and the selling by piece will yield crashing sensation, very the “Barusu.” Acrobatic coexistence of color, lines and material has full of tense close to “Barusu,” of course.